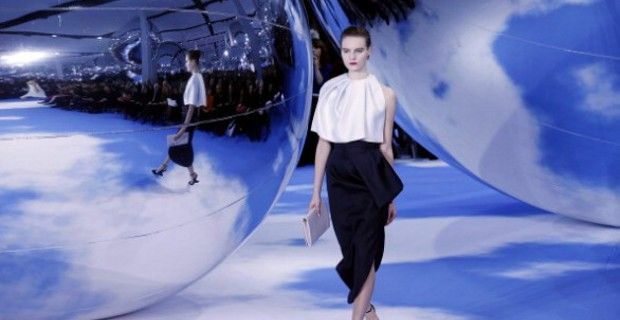 Christian Dior has just unveiled the new autumn winter 2013 collection at day four of Paris Fashion Week. After John Galliano's turmoil and after the short (and quite unhappy) period of interregnum with Bill Gaytten, Galliano's former right hand, the French fashion house seems to have found with Raf Simons its original elegance and grace. The Belgian designer has even managed to deeply move Anna Wintour with his last show for Jil Sander. Raf Simons established his leading position at the fashion house with a triumphal refined collection, minimal, but amazing in terms of shapes and prints. This is the new idea behind Christian Dior. Remember the baroque and flashy style of John Galliano? After admiring this latest collection we have reached the conclusion that the decadent period is eventually over. Raf Simons has in fact been able to restore Dior's original glory, that classy and sophisticated style that had defined the first collections of the brand, updating it with the use of modern geometric shapes, new volumes and innovative fabrics. The new Christian Dior collection is characterised by the use of very different fabrics, from dark leather, employed to create sensational trench and over-sized, flared coats, to colourful tulle peeping through mini-dresses, to silver metallic fabrics for the skirts, not to forget the ever present wool. The collection has a retro feeling, highlighted by the strapless dresses with full skirts, slim fit trousers coordinated with peplum tops, embellished with rouches and androgynous suits worn with platform shoes. Pied-de-poule prints in black & white are back, as well as geometric prints in the same monochromatic shade that feature on so many clothing. Dior has collaborated with The Andy Warhol Foundation for the Visual Arts to create the catwalk, and although Raf Simons is not Galliano and his shows are not as visionary and theatrical events, the runway was bursting with exquisite garments, characterised by minimal lines and extremely refined, delicate details. Raf Simons has really won us over!